There are a handful of restaurants and fast food joints that I like going to for one specific thing, and one specific thing only. Maybe they have other things on the menu that taste good. Maybe there are other things on the menu that aren’t so good. But either way, if I’m going to this place, I’m going to get that one specific thing, or the entire point of the trip is negated. If it’s Cracker Barrel, I’m going for the pancakes. A trip to Qdoba means I’m getting a chicken burrito with brown rice, corn, peppers and spicy salsa. Coldstone Creamery? Cake batter ice cream with graham cracker bits and caramel. Regardless of what city I’m in, if I’m eating at any Middle Eastern restaurant/deli, I don’t even need to look at a menu. I already know that I’m getting a chicken schwarma wrap with extra hummus. And then there’s The Texas Roadhouse. You guys know where I’m going with this. Anybody (ANY-friggin-body) who has ever been to The Texas Roadhouse knows exactly where I’m going with this. Don’t get me wrong, The Texas Roadhouse has other things on their menu that taste just fine. I have no complaints for the food in general. But for me, and I suspect for quite a few of you out there, there is but one thing that sets this place apart from all others. No. It’s not the peanut shells that are littered across the floor. Nope. I’m not talking about the caricature pictures of Dolly Parton and Willy Nelson on the wall. I’m talking about bread, guys. The best bread to ever pass your lips. I’m not kidding. The first time that you try the Texas Roadhouse bread, you’re going to need a minute to yourself just to process what is happening. You’re not going to think it’s possible that something as simple as bread can taste so good. You’re going to wonder what the heck has been that crap you’ve been eating for years at other restaurants that they try to pass off as ‘bread’ (Unless you’re at Red Lobster or Outback Steakhouse- they don’t count here). You’re probably even going to think that the chefs in the kitchen are slipping some crack in the dough. 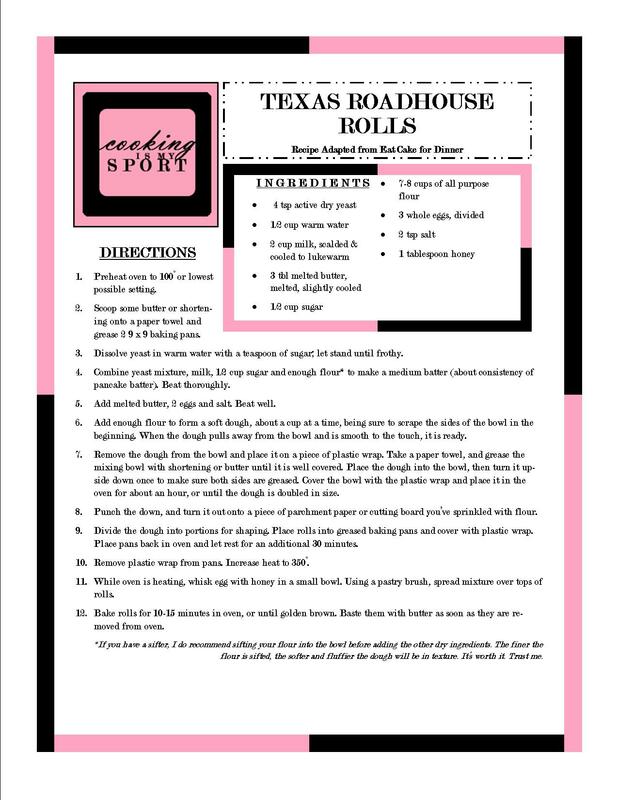 Well, they don’t put crack in the dough (at least, I THINK they don’t), but the developers at the Texas Roadhouse were definitely onto something the day they perfected this recipe. It’s just that good. When me and my family go to eat there, we always request extra bread, whether we end up with leftovers from our entrees or not. If you go to the Texas Roadhouse and don’t take home a doggy bag of the rolls, then you’re either on a diet (in which case I’m not sure why you’d be going to the TRH anyway), or you have no taste buds (which must be pretty terrible). I’ve had this recipe pinned to my food board on Pinterest for a long time now, but never got around to making it. This weekend, I decided to just stop the procrastination and get baking. The recipe for these rolls has been posted on lots of other food blogs, but I decided to go with the one that I saw first, at Eat Cake For Dinner. I didn’t do too much to change it. My changes were to shorten the rising time slightly (as my rolls doubled in size once molded quicker than hers). 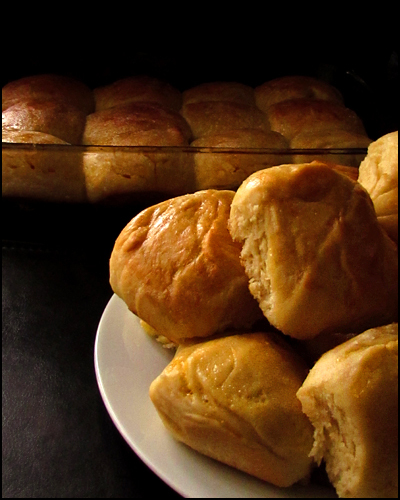 Whenever I make rolls, I always give them an egg and honey wash on the tops before baking, as I love the crust it gives them, along with an added sweetness. I suppose the main question on everyone’s mind is: do they taste like the rolls from Texas Roadhouse? Well…yes and no. From my own research on the subject, I’ve read that the authentic ones are made with a flour that has a kind of evaporated/dry form of honey sifted into it, and that they also do not contain eggs or milk so as to widen the restaurant’s audience to include allergy sensitive customers. I can’t imagine how this is possible, but since my rolls do contain eggs and milk, and don’t have any mad scientist flour, it’s obvious that they aren’t going to be the exact same as the original. BUT….they ARE friggin delicious. 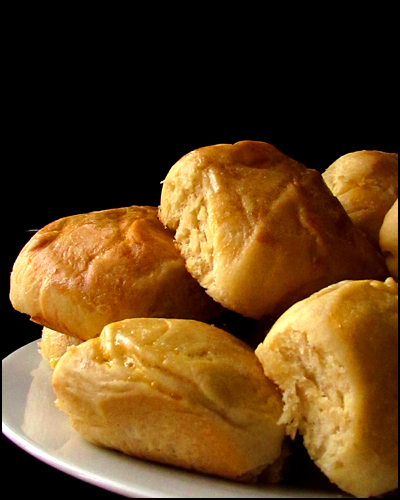 And if you have a craving for TRH rolls and don’t have one in your town (or you just can’t stand listening to country music), then these will definitely do in a pinch. I’d make them again for sure. FEED(ME)BACK: Name one food from any restaurant that you only go there to get, every time. 1. Preheat oven to 100° or lowest possible setting. 2. Scoop some butter or shortening onto a paper towel and grease 2 9 x 9 baking pans. 3. Dissolve yeast in warm water with a teaspoon of sugar; let stand until frothy. 4. Combine yeast mixture, milk, 1/2 cup sugar and enough flour* to make a medium batter (about consistency of pancake batter). Beat thoroughly. 5. Add melted butter, 2 eggs and salt. Beat well. 6. Add enough flour to form a soft dough, about a cup at a time, being sure to scrape the sides of the bowl in the beginning. When the dough pulls away from the bowl and is smooth to the touch, it is ready. 7. Remove the dough from the bowl and place it on a piece of plastic wrap. Take a paper towel, and grease the mixing bowl with shortening or butter until it is well covered. Place the dough into the bowl, then turn it upside down once to make sure both sides are greased. Cover the bowl with the plastic wrap and place it in the oven for about an hour, or until the dough is doubled in size. 8. Punch the down, and turn it out onto a piece of parchment paper or cutting board you’ve sprinkled with flour. 9. Divide the dough into portions for shaping. Place rolls into greased baking pans and cover with plastic wrap. Place pans back in oven and let rest for an additional 30 minutes. 10. Remove plastic wrap from pans. Increase heat to 350°. 11. While oven is heating, whisk egg with honey in a small bowl. Using a pastry brush, spread mixture over tops of rolls. 12. 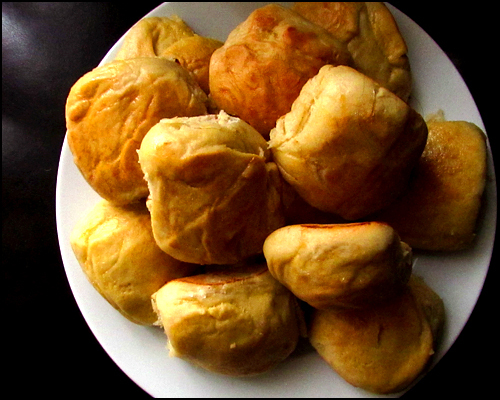 Bake rolls for 10-15 minutes in oven, or until golden brown. Baste them with butter as soon as they are removed from oven. *If you have a sifter, I do recommend sifting your flour into the bowl before adding the other dry ingredients. The finer the flour is sifted, the softer and fluffier the dough will be in texture. It’s worth it. Trust me.